The 2011 NCAA Men's Basketball Tournament has begun. March Madness! Sixty-eight of the best teams in the country were selected to compete, including many so-called "Cinderella" teams that earned the right to play by virtue of winning their conference tournament championships. Teams from these minor conferences are unlikely to compete well with teams from the "power" conferences. But of course they have a chance. In the tournament, no team is assured of victory. I've noticed that the team that wins isn't always the more talented team, but the team that wants it more - the team that brings maximum aggressiveness, energy, intensity and athleticism, especially on defense. Which is why the "Cinderella" teams are there. They really do have a chance, and upsets are common in the tournament. The "Cinderella" reference was first applied to the most amazing victory in the history of the tournament. 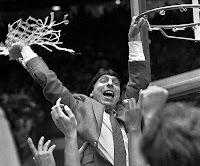 That was the 1983 NCAA championship, which was won by the North Carolina State Wolfpack, coached by Jim Valvano. At the end of the regular season, NC State was 17-10 and wouldn’t have been selected for the tournament. But they put together some close victories and won the ACC Tournament, which gave them an automatic bid. During the ACC tournament, they defeated top-ranked teams North Carolina (Michael Jordan and James Worthy) and Virginia (Ralph Sampson). Once they were in the tournament, they didn't stop winning. Amazingly, they won their way into the finals against Houston (Hakeem Olajuwon). The score was tied with only a couple seconds to go, and the last play was a desperation airball from 30 feet, which was caught and dunked in the final second to give State a 54-52 victory. A classic “Cinderella” team, NC State shouldn’t have gone far in the tournament, but they played their hearts out every minute and refused to give up. It's a great piece of sports history, and it's a great lesson in perseverance. It's amazing what you can accomplish if you believe in yourself and simply refuse to quit. If you've never heard Jim Valvano's "Never Give Up" speech, which he delivered in front of the ESPY Awards audience in 1993, eight weeks before he died of cancer, I highly recommend it. Also see "Never Give Up, Part I - Leonard and Hearns"
Post by Dennis E. Coates, Ph.D., , Copyright 2010. Building Personal Strength . I remember watching the game vividly. The Lorenzo Charles put-back dunk, Jim Valvano running around looking confused, and bedlam. One of the all time great upsets in sport.